Views, Ocean, Sunset, Mountains, Jungle, Rainbows, Waterfalls, Views and Refreshing Breezes! Within the Hanalei Bay Villas, this individual family home is 'Haleakamanu' - the house of the birds. It is situated within walking distance of the luxurious Princeville Hotel and its’ renowned Pu’u Poa Beach. 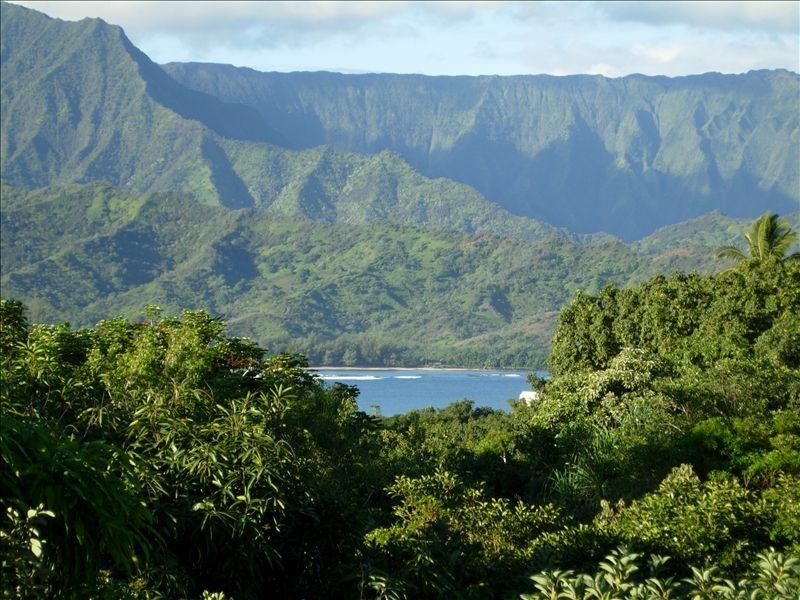 It offers spectacular vistas of the mountains surrounding Hanalei Valley and an ocean view of Hanalei Bay across the top of the jungle canopy. It has a Hawaiian 'Sense of Place' - for complete relaxation, yet convenient to all the sights and experiences that the North Shore of Kaua’i has to offer. Enjoy sleeping peacefully to the sounds of the palm trees swaying in the gentle trade winds mixed with the sound of the ocean waves just across the street. By day, sit back; watch the variety of birds that come to visit you, as the splendor of Kauai's daily rainbows unfold above the panoramic vista from the upper lanai. From the lanai you can almost touch the tops of the tropical fruit trees; mango, avocado, guava and java plum. At days end, witness the spectacular sunsets from the famous Bali Hai (Makana Peak) lookout, located right across the street from your own front door and individual parking space. This two-bedroom/2.5-bath, stand-alone villa; has 1250 square feet and is ideal for couples or a family desiring a beautiful setting for a rejuvenating vacation. Haleakamanu is a two story, free standing home that has been recently renovated with bamboo floors upstairs and new carpeting downstairs. It has been decorated with attention to tropical-style furniture and Hawaiian details. Upstairs is the living area; with a spacious living room, entertainment center and sliding doors to the lanai. Adjacent to the living room is the kitchen and the dining area and both are also open to the wonderful views. Enjoy creating fine culinary delights in the well appointed kitchen. It's well stocked, and ready for your use. Also located upstairs, is a convenient ½-bath and desk with phone and internet access. Downstairs you will find the bedrooms, the remaining baths and the laundry. The large master bedroom suite is comfortably equipped with a queen size bed, dressing alcove and closet, with a full bath and its’ own lanai. It has its’ own TV and telephone. The second bedroom is perfect for additional guests or additional family members, it has two twin beds and an adjacent bathroom with shower. The décor complements the lush garden surroundings. The outside is brought inside by copious windows – on both floors. The windows (forty-two and counting) are open to the light, surrounding views and cool tropical breezes. Both of the bedrooms and the living room have ceiling fans. When you are looking for adventure, Haleakamanu offers you access to the best activities on Kaua’i. Beach destinations are varied and plentiful. Many are among the top rated beaches in the world and some are hidden treasures. Within walking distance you will find; Pu’u Poa, Hideaways, Kenomene (in front of Pali Ke Kua) and Queen’s Bath. It is a short but scenic drive to beaches of Ke’e, Tunnels, Ha’ena, Lumaha’i, Hanalei Bay, ‘Annini, Kalihiwai and to Secret Beach. Hikers are attracted by the nearby Kalalau Trail and the Na Pali Coast, but the trailhead for the often overlooked Powerline Trail is just a few miles away. The North Shore area offers the many activities listed below; plus it remains within driving distance of all the attractions of Kapa’a, Lihue, the South Shore, and Waimea Canyon (just get back by sunset, if you can!). Hanalei Bay Villa - Vacation in Paradise! Keywords: Free standing house,villa, hideaways, snorkel, golf. Our aloha for all things Hawaiian began as we listened to the stories of our kapuna (elders). They told us of their trips to Hawai'i and the beauty the aina (land). They described the sweeping views, mauka (mountain) and makai (sea), lush tropical vegetation and the warm, gentle climate. On our own first trip to the islands in 1969, we found all that and much more. We found even greater beauty in the people of Hawai'i. As the opportunities came to connect with them, their culture, mele (song) and hula (dance), we were led to discover the true meaning of Aloha. We chose the North Shore of Kaua'i because of its' great climate and its' access to the water. When we first came to Hawai'i, it was to coach Water Polo teams entered in tournaments on O'ahu. Years later the purpose was to participate in the Ironman Triathlon in Kona. We have swam, snorkeled, paddled, body surfed, lifeguarded, taught and coached swimmers of all ages for decades. For us, now, the North Shore of Kaua'i was the best possible spot for us to maintain our connection with the water. We chose our home in the Hanalei Bay Villas because of the views (mountain, jungle and sea) and because of its' privacy and serenity. It has a Hawaiian sense of place. To preserve this place is our kuleana (responsibility). We truly enjoy sharing this makana (gift) of aloha with our guests. Many of them describe its' mystical qualities of the place, its' healing power, spiritual sense and meditative tranquility. It is definitely a place where one remain in the moment. And yet, be in the water within a short walk. We enjoy being at home in Kaua'i. The simple routines of the day, like going to the market, are a pleasure, enhanced by the climate and the surrounding beauty. We also enjoy exploring everything else the Island has to offer. In September we had the opportunity to paddle the Napali Coast, with Kayaks Kaua'i out of Hanalei. The trip took all day, including the shuttle ride back from Polihale and was a great adventure. From one extreme to the other, for us it is all good! Dramatic mountain view, guests have said that it "changes by the minute". Complete with waterfalls and rainbows. Kitchen renovated January 2017 with new cabinets and quartz countertops. Mature specimen plants and palms. Princeville Makai course is adjacent. Three tropical ceiling fans and forty-two Windows (over half w/ Louvers and screens to let in gentle breezes) to keep you cool. Very clean and organized. Enjoyed listening to the birds and jungle mountain view. Thanks! This house is in a beautiful location with a great view of the treetops, mountains and a sliver of ocean. The location is very convenient to the town of Hanalei and the state beach where we went swimming several times. Hanalei has good shopping and lots of food options. We loved the coconut ice cream at Pinks and the coffee and smoothies at the Hanalei bread company. The location is also convenient to other beaches with snorkeling. We liked Anini beach and saw a lot of sea turtles while snorkeling. The house is in a great location for everything in the north shore. The house itself is lovely with pretty and comfortable furnishings and decor. It is clearly a home with everything you would need in the kitchen including things like spices and cooking oil, coffee maker and filters, paper towels, cleaning supplies and soap in all the bathrooms. Nice washer dryer. Best of all beach chairs, bogey boards, beach towels and snorkeling gear. We loved our stay and would recommend this place to everyone. Loved, loved, loved it. Thank you for helping us have a wonderful vacation! Perfect place for our family of four. Very nice 2 bedroom house with fully equipped kitchen, nicely decorated and clean. We had a wonderful stay at Joe & Linda's place in Princeville. It's centrally located to explore the North Shore and has everything you need to make your Hawaiian vacation complete - sand, surf, secluded beaches, hikes, markets, and restaurants. And the kitchen is great for cooking a meal from the many wonderful farmers markets in the area. From the easy communication with our hosts to the recommendations guide, to the unbeatable view from the living room and the lanai (only one side has neighbors!) it truly is a perfect spot for a getaway in paradise. Mahalo for your thoughtful review. Weʻre glad you had a good visit. You are right, our location is very special. One of the best things about this condo is the mountain and sea view from the balcony. We really enjoyed eating breakfast out there every morning, and star gazing at night. At the end of a row of condos, mostly surrounded by lush greenery, this standalone two-level condo is clean and spacious, with a well-equipped and recently renovated kitchen. It is well-located, right across the street from one of the top sunset viewing areas overlooking the ocean. Note that the condo complex is not located on the beach, but rather is close to a spot overlooking the water from high above. Closest beach access within walking distance (about 15 min) is Hideaways, near the St. Regis hotel (accessed by a steep, rocky, muddy path, just like many beaches in Kauai!). That being said, there are so many beaches to explore on the island and you'll need to go by car to most. All in all, I highly recommend this condo if you're looking to stay in Princeville-- it was just my husband and me, but it could easily accommodate two couples or a family. Beach Walks, Botanical Gardens (Limahuli, Na Aina Kai, National Tropical), great Golf on the renowned Robert Trent Jones Jr, Makai and Prince Courses, Helicopter Tours (Princeville Airport), Hiking (Kalalau Trail/Na Pali Coast, Powerline Trail), Jogging, Kayaking (Hanalei River and Bay), Kite Surfing, Scuba Diving, Shopping (Princeville Center, Kilauea, Hanalei Town), Sight Seeing, Tennis (courts available to the public at Hanalei Bay Resort & Princeville Tennis Club) Whale Watching (in season), Wild Life Viewing (Kilauea Lighthouse and Hanalei River Valley), and Zip-Line adventure, Many other places to experience and activities to enjoy, await your discovery! Stays shorter than four nights will be considered when calendar permits - contact owner.